A person wants to travel to Lahore from Karachi. He makes a firm determination that he really has to go there. He makes the proper arrangements, schedules a day for departure and gets the tickets for the trip. On the appointed day he picks his belonging and boards the bus. However, once he is few hundred miles on the road, he finds out this bus is going to Quetta Not Lahore. If he continues on this bus he will never reach Lahore? Was there any doubt about his firm determination to travel to Lahore? Had he not prepare well? Did he not buy the tickets, reach the station on correct time and board the bus? 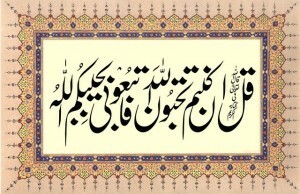 In other words he had total ikhlas (sincerity) in determination and action. But he boarded the wrong bus! The one travelling in the other direction. This correct direction thing is the sidiq of Sufiya. See Sidiq counts even more than ikhlas. Sometimes a infidel commits kufur with extreme ikhlas. Similarly all bida’ats (innovations in matter of religion) are done with total ikhlas. But they completely lack sidiq. The correct direction/method/way (that is sidiq) is the following of Sunnah in all matters. May Allah SWT give us the true understanding and following of deen. This entry was posted in B. Praise worthy morals on December 5, 2005 by 'abd.